This is a wonderful book and as you might know she has her own blog with a huge following and then wrote a book. Before it was published she suffered a horrible depression and did not blog for over a year as it was very serious. That is how I found her work actually, the 2 stories about depression described how one feels when depressed more than anything I have ever read. (I have depression and my 23 year old daughter took her own life 4-11-13). Also the book is extremely funny. Her drawings she has written, are childlike on purpose. I think her work is great. It made me laugh when I REALLY needed it. Thank you for your comment and I am just so sorry to hear about your daughter. 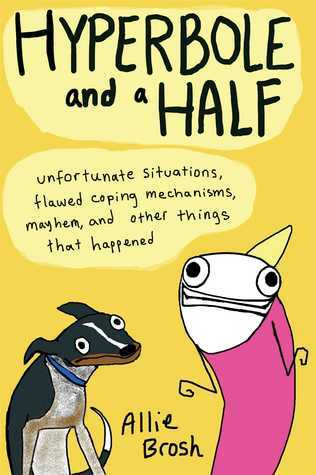 I admire you and Allie and all those who struggle with depression so much – and this book has obviously already helped all of us understand it better. Hopefully soon depression will be discussed as openly as other diseases are, and again, books like this help. I wish you much peace and thank you once again for your comment.